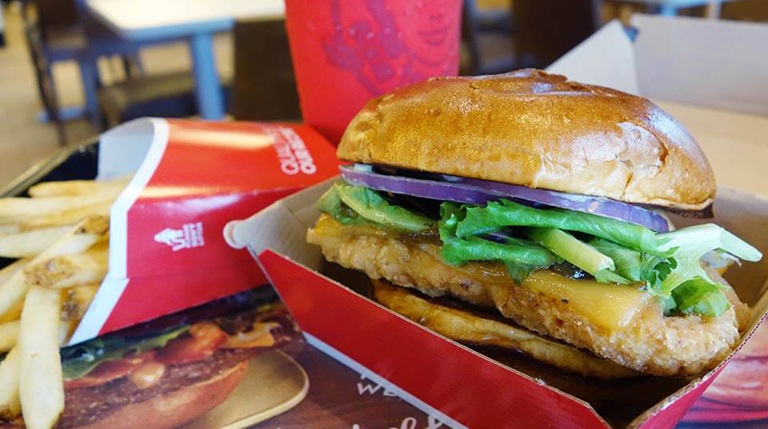 Wendy's does fast food classically, with square burgers, fries, frosty's and more! Wendy’s slogan “Quality is our recipe,” Wendy’s guarantees satisfaction and quality in every mouthwatering bite, of an old fashion classic, 100% beef square burger. Treat yourself to a classic quarter pound of 100% real North American ground beef topped with premium toppings on a warm toasted bun. Choose from their Dave’s Hot ‘N Juicy, Baconator, Doule Stack, Green Chile Quesoburger and more, all shaped square to add charisma to every bite! Fresh-made salads served with tasty vegetables topped with fresh chicken include their classic Asian cashew chicken, bbq ranch chicken, apple pecan chicken salads. Wendy’s also serves nuggets, chicken sandwiches, wraps, filled potatos, chili, French fries and of course, everyone’s favorite, Frosty’s. Creamy, cold, and refreshing, the Frosty makes a perfect summer day dessert, or dip your French fries in it for that classic retro taste. Made with real milk, nothing is more satisfying than this Wendy’s traditional item. Wendy’s offers an old fashion menu with flavors that will continue making you come back for more! Just can’t get enough of those delicious square burgers!